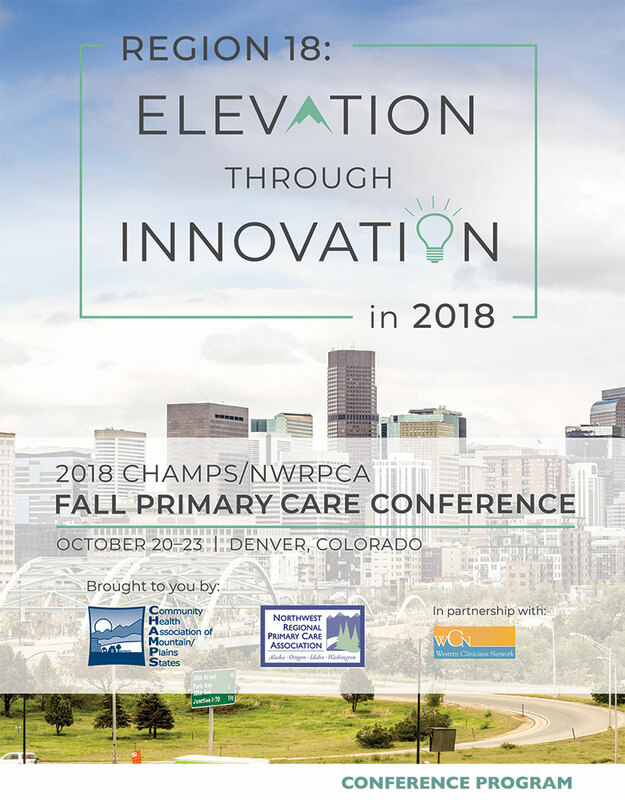 The 2018 CHAMPS/NWRPCA Fall Primary Care Conference, in partnership with WCN, to be held in Denver, CO, October 20- 23, 2018, provides education and training, information and resource sharing, coalition building, and program and policy development for like-minded community health professionals and their partners. Also join us for the pre-conference NACHC Training for New Clinical Directors in Denver, October 19-20. This 1.5 day event is perfect for clinical and medical directors as it provides the core knowledge and competencies that all health center Clinical Directors need to function as effective managers, leaders, and advocates for their health centers and communities. Paul Huschilt, Humor & Wellness Expert. Paul shares techniques to get the most out of work and like, and to laugh at just about anything. Paul reminds you to take care of yourself so you can take care of others. Described as indescribable, he is one of the most unique voices inspiring wellness. Paul is a trained actor with degrees in management and Theater, a diploma in Career counseling, and training in Adult Education. He has worked extensively with health care, such as pubic health departments, hospitals, and nursing associations. His varied background and 18 years of professional speaking experience give Paul an unforgettable style that is both educational and entertaining. Download and share the PDF with your team. Does your organization offer professional development benefits? Consider attending Fall Primary Care Conference. Download a customized attendance request template to submit to your supervisor and team. Conference Program now available for preview! Download Wellness Room and Therapy Dog Schedule. Agenda as of October 10, 2018. Event sponsored by Scribe-X, Synergy Billing, and CHAMPS/NWRPCA. Join us for a 1.5 day pre-conference training in Denver, CO, October 19-20 right before the Fall Primary Care Conference. Training for New Clinical Directors is a foundational and essential building block in your career development as a health center Clinical Director. This training provides the core knowledge and competencies that all health center Clinical Directors need to function as effective managers, leaders, and advocates for their health centers and communities. In addition to providing contextual knowledge regarding the history, terminology, political evolution, and regulatory expectations of the Health Center Movement, course content also focuses on developing competencies in evolving healthcare issues. Speakers include Dr. Keith Horwood, MD, Associate Medical Director of Community Health Centers, Inc., and Dr. Kumble Rajesh, MD, FAAP, Chief Medical Officer of Lowell Community Health Center. This training offers 11 CEU Credits for continuing medical education (CME). A $200 discount is available for participants who want to attend both the training and full Fall Primary Care Conference. If you have already registered for the full Fall Primary Care Conference and would like to add the NACHC Training for New Clinical Directors, please contact the Registration Team at registration@nwrpca.org or 206-783-3004 so we can adjust your registration with the discounted rate. Click here for more information about the training and Register Today. Sponsor and advertise at the 2018 Fall Primary Care Conference and connect with CHC leadership nationwide. We have an outstanding exhibitor foyer conductive to promoting your products and services. All sponsors are featured in the printed conference program, social media and signage throughout the event. Click through the Fall Primary Care Conference prospectus below, or download a PDF version (~2MB). Please contact NWRPCA Development Specialist Janeane Harwell for more information about sponsorship opportunities. Conference venue information will also be sent to you in your registration confirmation email. We are pleased to offer a discount off all published fares to Denver from any Alaska Airlines U.S. city via Alaska Airlines. If you are traveling to Denver by air, we encourage you to book with Alaska Airlines and to receive a 7% discount. To participate, go to the Alaska Airlines website and click Use discount or companion fare code and enter ECMZ850 in the discount code field. Code is available starting July 9. In support of helping health center staff, clinicians, administration, and board of directors pursue professional development, NWRPCA and CHAMPS conferences are a consistent source of continuing education units (CEU). This year we are offering the following CEU opportunities: continuing medical education (CME), continuing dental education (CDE), continuing nursing education (CNE), continuing professional education (CPE), continuing human resources credit (HR), continuing governance credit (GOV), and continuing social work and counseling education (NASW). The specific 2018 Fall Primary Care Conference CEUs will be announced. We are currently seeking volunteers for the Fall Primary Care Conference! Read the complete Volunteer description on Idealist.org and contact Marleen Arenivar, NWRPCA's Event Planner, for any questions. Rates after Friday, September 21, 2018 increase by $100 for full conference, $50 for two-day, and $25 for individual days. If you are registering a group of four or more CHAMPS/NWRPCA/WCN members, please use the 2018FallGroup discount code on the payment screen to receive 10% off your group's registration. Please note the registration cancellation deadline is Friday, October 6, 2018. Cancellations must be in writing (email is fine). Registration will be refunded less a $50 processing fee. Cancellations made after the deadline are not refundable. For any questions, complaints/grievances, please email registration@nwrpca.org. If your organization offers professional development benefits, consider attending Fall Primary Care Conference. Download a customized attendance request template to submit to your supervisor and team.